This artist's concept depicts a cometlike tail of a possible disintegrating super Mercury-size planet candidate as it transits, or crosses, its parent star, named KIC 12557548. At an orbital distance of only twice the diameter of its star, the surface temperature of the potential planet is so high, the surface would melt and evaporate, according to the results of a study. 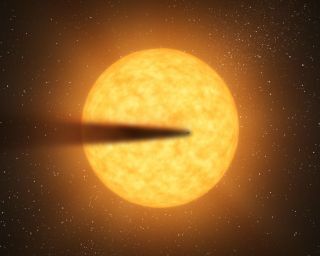 Astronomers have found a dusty tail streaming off a faraway alien planet, suggesting that the tiny, scorching-hot world is indeed falling apart. In May, researchers announced the detection of a possibly distintegrating exoplanet, a roughly Mercury-size world being boiled away by the intense heat of its parent star. Now, a different team has found strong evidence in support of the find — a massive dust cloud shed by the planet, similar to the tail of a comet. Both studies used observations from NASA's Kepler space telescope, which spots alien planets by flagging the telltale brightness dips caused when they pass in front of their parent stars from the instrument's perspective. The unfortunate alien planet lies about 1,500 light-years away from Earth. It sits very close to its host star — completing an orbit every 15 hours — and is therefore incredibly hot, with surface temperatures estimated to be around 3,600 degrees Fahrenheit (1,982 degrees Celsius). In the new study, a different team of scientists affirms the existence of this planetary dust tail. Looking closely at Kepler's data, they found clear signals that KIC 12557548's light is being scattered and absorbed by large amounts of dust. "Some of this dust escapes into space, where the intense stellar radiation quickly evaporates it," study lead author Matteo Brogi, of Leiden University in the Netherlands, said in a statement. "The variable amount of dust leads to the observed variability in the star's dimming." Further work with different instruments could help nail down just what the planet is made of, researchers said. "By observing the dust clouds in different colors, something Kepler cannot do, we will be able to determine the amount and the composition of the dust and estimate its lifetime," said co-author Christoph Keller, also of Leiden University. "As the evaporation peels the planet like an onion, we can now see what used to be the inside of a planet." The study has been accepted for publication in the journal Astronomy & Astrophysics. The $600 million Kepler space telescope launched in March 2009. Since then, it has detected more than 2,300 potential alien planets, 77 of which have been confirmed to date. Kepler scientists have estimated that at least 80 percent of the instrument's finds will end up being the real deal.